Thanks to a helpful tweet, I took a quick trip out to the Hopetoun Estate this weekend to look at the Hopetoun Farm Shop on the A904. Having been there before, I knew the standard of produce on offer was good, but I was blown away by the choice of quality gluten free foods! As soon as I walked in the door, I was drawn to this extensive stand of gluten free goodies. 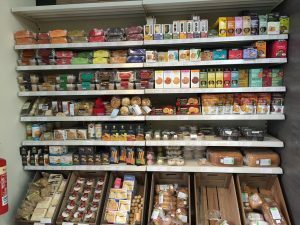 There is a good range of bread, rolls and cake from the Wheat Free Bakery – a local gluten free supplier and all sorts of different biscuits, oatcakes and shortbread, some of which I had not tried before. I picked an oat and pumpkin sandwich loaf and a wee carrot cake from the bakery straight off.. Clearly the cake this is one of my five a day! It is a tasty cake and is really moist, well flavoured and no grit. I should happily try the rest of the range as they look good quality and going by this one, the bakery knows what it is doing. Other items chosen included: a few savoury biscuits by The Foods of Athenry; some Lemon Oat Thins from Pulsetta (an Aberdeen business); a ready made Sticky Toffee Pudding by Hunter’s Puddings (for my teenage tester) and the most exciting discovery: gluten free sausages, homemade by the Hopetoun Butchers. The butchery range is terrific too, with estate reared meats and game plus homemade burgers, sausages and pies (not GF, but who’s complaining with what else is on offer?). From the quirky vegetable store in a horsebox outside the door I also picked up some really good local vegetables. I also found a bottle of Botanist Gin – a superb and unique flavoured gin distilled on the island of Islay and a great favourite of mine, though I can never find it. As is well known to readers of my blog, gin is always gluten free. 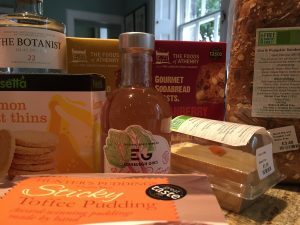 The Hopetoun Farm Shop is definitely worth a detour if you are travelling northwards, or if you are just looking for a range of high quality gluten free foods in the Edinburgh area that you can put into the freezer. It is in a lovely location and is beside a very good garden centre, so you could make a trip of it. During the summer there is a Hopetoun Farm Grill beside the shop. And while researching, I spooted that for the weekend of Saturday 3 and Sunday 4 October, the chef will be producing GLUTEN FREE sharing platters featuring estate reared burgers and sausages, as well as gluten free bread and homemade potato salad to enjoy with the meats. It will be open from 11 to 4 pm – definitely worth a visit and let’s hope the sun shines! I highly commend this shop both as a supplier of locally and estate sourced quality food and as a business that has embraced quality gluten free produce. It is definitely a new favourite and is now on my satnav for regular visits. Please mention Gluten Free Edinburgh when booking.